(NewsUSA) – According to the Centers for Disease Control and Prevention, there are more than 80 million injury-related visits to doctors’ offices, hospital outpatient departments and emergency treatment facilities in the U.S. each year. Of these cases, an estimated 9.2 million children annually have an initial emergency department visit for an unintentional injury. Certainly, if we could predict when, where and how our children would be injured, we would try to prevent it. Unfortunately, accidents happen unexpectedly. Therefore, it is essential to take safety precautions year-round to help limit the time we spend in the emergency room. As a new season and new sports activities start for many families, it’s important to keep the following tips in mind to help prevent children from unexpected injuries: Dress appropriately. Whether your child is playing outside, riding a bike or playing a sport at school, wearing the appropriate gear and apparel could make all the difference. For example, wearing a bicycle helmet while biking can reduce a child’s risk of head injury by 85 percent and reduce the risk of brain injury by 88 percent. Know the rules of the game. There’s a reason why tripping, facemask grabbing, below-the-knees blocking and helmet-to-helmet contact are prohibited in football. They can be dangerous to both the player and others. When kids know the rules of the game — what’s permitted and what’s not — fewer injuries can occur. Prepare. 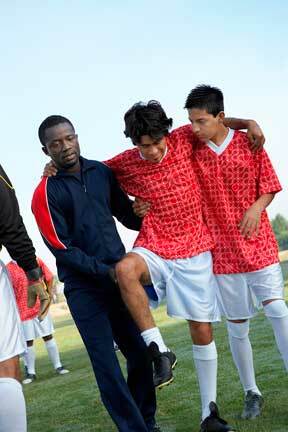 Before going to practice or to a game, make sure your kids are appropriately prepared. A proper warm-up helps make the body’s tissues warmer and more flexible. Cool-down exercises loosen muscles that have tightened during exercise. Listen to your body. Teach your child that if they feel any pain or discomfort while playing, they should notify an adult as soon as possible. While sitting on the sideline may not be fun, pushing through the pain can result in a more serious injury and keep them out of action longer. Life can change in an instant, and if a trip to the ER happens, you can at least prepare your children — and yourself — financially. Consider adding an accident insurance plan to help stay ahead of medical bills and out-of-pocket costs that often accumulate with an unexpected serious injury or accident. To learn more about the benefits of an accident insurance policy, ask your human resources representative at work or visit www.aflac.com/accident.